Here is everything you need to know about buying a bridal shop! Most Canadians are getting married later in life. Couples are waiting until their late 20s or early 30s to tie the knot. As people are getting married when they have more disposable income, the wedding industry keeps growing and weddings are becoming more extravagant and elaborate. A bridal shop, therefore, is a great business in which to invest. Not only can it be profitable, but it also allows you to use your creativity and be part of many a bride’s big days! Although the wedding industry has been around for decades, it has changed dramatically over time. Customers are far more concerned with the type of experience they have when dealing with your bridal shop than before. Social media is playing a big role in shaping the kind of weddings that are popular from year to year. If you want to have a successful bridal shop, you will need to keep up to date with trends as well as make sure your business has an online presence. You need to know who your target market is going to be. Your market is already narrowly defined by the fact that you are only marketing to brides. Consider, however, who within that market you are catering for. Will you be stocking high-end designer dresses or are you going to stock dresses on the lower end of the price scale. There are even some very reputable dress shops that stocking previously worn wedding dresses. These shops are seeing great success as a lot of brides are able to get the right dress at a fraction of the price. You will need to buy a business that has a good relationship with reputable stockists so that you can take over these relationships when you buy the business. Visit as many bridal shops as possible so that you can get the right idea of what you want from your shop and what you don’t. There will be a need for anyone running a bridal shop to have a creative flair. Wedding dresses are expensive and so choosing the right ones to stock is a vital skill. When you are buying a bridal shop, make sure that you have looked at the current stock of dresses and whether these are included in the sale. You will also need to be able to alter wedding dresses or hire someone who can do this for you. Remember that being able to sew is one skill, altering wedding dresses is something that often takes years of practice. Do as much research as possible on the industry so that you know what is already being offered and how your business will compete with this. Will you offer more than just the dress? Many bridal shops stock shoes, jewellery and other clothing and accessories for the wedding. Will you be encouraging walk-ins or appointments? If you know what kind of business you want to run, you can narrow down which bridal shop you want to buy. Once you have bought the business, however, you will still need to work hard to turn it into your best version of the business. 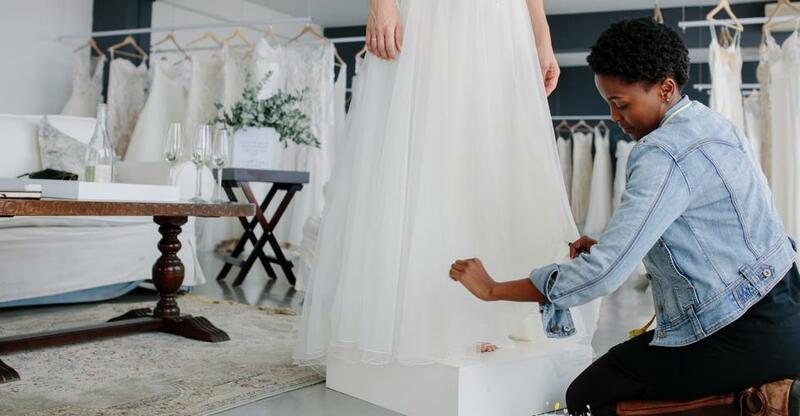 Here is what you need to know before you leap into the bridal shop industry.